Well we are 4 games in, and we have now lost 3 starters to season ending injuries. Sitton was the first to go, and was a very hard loss. With Sitton in, we could easily run the ball. Now that Larsen is back, we had a huge drop off in running performance the last 2 games. Then Hayes goes down in the third game, hurting our run defense. I hate to say it, but Harris is a bust. He can't play the run, and is invisible on passing downs. The Dolphins promoted a DE from the practice squad to add to the rotation, and he played better than Harris against the Patriots. Now we loose Kilgore for the season, and Tannehill just became an dead QB walking. Swanson is a serviceable C, but he is a clear step down from Kilgore. The pass protection got worse as the game went on, with Gase benching Tannehill after a really bad sack. Gase admitted that he was worried about Tannehills health. Tanny seems very slow this year, like he is playing a gear short. Osweiler was much quicker getting the ball out, and was throwing with velocity compared to Tannehill. Gase also made the comment during his press conference that Tannehill had targets to throw to. I predicted that Tannehill wouldn't make it through the season, and it looks to be coming true. We have some of the best skill position players we have had in a long time, and can't capitalize on it. The Bengals are going to be blitzing us right up the middle all game. The Dolphins are going to have to sign another backup C. This is just horrible. Well we are 4 games in, and we have now lost 3 starters to season ending injuries. I'm sorry but.. I don't care. Every team deals with injuries. Good teams have good depth. If your team is so poorly constructed that only having 19 out of 22 projected starters tanks your season.. you simply don't have a good team. Squads are 53 men deep for a reason. That's the point, we aren't a good team. We were a decent team with a great set of skill position players. Now we are a team with a hobbled QB with bad pocket presence, a mediocre O-line, and a young Defense. I was going to look at the injury report but suddenly I got distracted by the AFC East standings. Yeah, losing 40% of the starting O-line for the year is a killer for any team, depth or not. Gonna be ugly. Very true that all teams deal with injuries, and depth is important to have when injuries come up. Here's the thing; we lost 3 of 5 starters in the shallowest position group in the entire NFL. O-line play in the league is declining across the board. I feel like each year scouts criticize the quality of linemen coming out for the draft, and offensive line coaches who have been around a while mention publicly every so often that the quality of line play has dropped off. Think about it; most teams would probably say that they have 1-2 offensive linemen who start that are clear weak links who shouldn't be starting. If guys who are starters are "bad", then generally, any backup offensive lineman in this league is going to be overwhelmed. If you have a clear weak link on the o line, it's going to be difficult to move the ball. If you have THREE weak links outta five, well...your offense is screwed. Honestly, losing 3 players in any single position group would be tough, but losing 3 offensive lineman is rare, and not something you can easily plan for as a GM especially considering how shallow the league is right now at o line. We can now add Albert Wilson to the pile of injured players. It has been reported that best case scenario is he is out 4 to 6 weeks. Worst case is IR. Stills is undergoing and MRI today to see if he tore his groin. If so, he would also go to IR. The hits just keep coming. On another note, Chase Allen did get put on IR. He was our best backup LB, and a core special teams player, so his loss will hurt. Allen was very good in run support, now Anthony is the primary backup, and he is very weak against the run. Where do the Dolphins go to fill the void at WR? Obviously biased (username checks out), but I loved Isaiah Ford at Virginia Tech, he would prob fit Gase offense too. Any word if he has a chance to make the team? I too would love to see Ford get a shot at playing, with VT being my hometown team I have watched Ford over his college career and he is a very smart and gifted receiver. Carroo? If you'r not bringing him up if Wilson and Stills are down, why is he still being kept? Carroo was a 3rd rounder in his 3rd season with the team now. Previous regime drafted him and he's show NOTHING in 3 seasons to justify his draft position (which is a sunk cost at this point). Neither has Ford.. but he has 2.5 seasons left under contract, and is cheaper. Carroo or Ford would work, long as they catch the ball. Or keep running a RB at slot receiver? TE at slot? Won't matter if the defense plays so incredibly turble again. 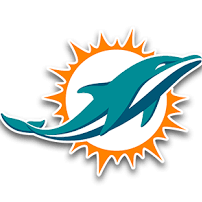 Don't worry, they crapped the bed last week, according to Dolphins Logic they will play lights out this week. Right? Right?? Our DL can't get pressure on the QB. Sadly Wake started the season slowly (he was playing well but not quite finishing) and his first game back from injury was.. uninspiring.